In this workshop, students are shown how to use their knowledge of the actual consequences of alcohol or other substances to develop effective media. This workshop describes the process for involving youth in the development and effective delivery of youth-driven media. Analysis of PSAs and skits as well as coaching techniques for presentations, are demonstrated using audience participation. 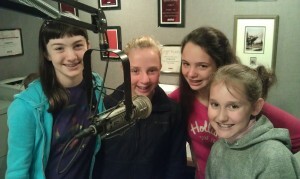 Youth have great potential to send their message through the media. This workshop is designed to teach youth (and /or the adult advisers they work with) how to send their message on alcohol or other substances through media that they have created. This workshop focuses on creating media in conceptual terms – meaning the focus is on developing the message and creating a script, idea or concept to deliver the message. This workshop does not include creating media from the standpoint of technical production such as video production or editing, electronic recording, audio production or other technology based skills. Attendees are instructed in a simple multi-step approach: from stating initial goal and strategy formation through concept development, finish draft and recording process. In an initial interactive classroom presentation, students are taught to identify different media strategy types and develop an understanding of basic terms such as “target audience”. Students are challenged to identify different message types and strategies in examples of real public service announcements (PSAs) and other media and consider how the authors intended to change the audience’s behavior or attitudes. Following the core presentation, students are separated into small breakout groups and each group is provided a script of an actual 30- or 60-second radio PSA to prepare to present to the larger group. After each group presents, the audience is asked to identify the core message, appropriate target audience, and media strategy. This provides the group with the skills to select an existing script that matches their message and target audience, and prepare to record that in a studio. The students are then sent back into breakout groups and each group is provided with a sheet of instructions that challenges them to create an original PSA script on a certain substance or issue such as underage drinking – and the group is given a theme or setting to build the script around. This exposes the students to the process of developing an original concept. Breakout groups are coached as they work on their draft ideas. At the conclusion, groups return and present their draft concepts to the larger group. This workshop is very interactive and is primarily designed for youth that will be involved in some form of advocacy. We use radio PSAs to teach the concepts and skills but the principles of media message development taught here apply equally to other types of media that can convey the student’s core message (posters, skits, video PSAs, etc.). Training time is flexible but a 3 – 4 hour block is the minimum requirement to accomplish all of the elements described above. More time is required if the organization wishes to have a more finished script that is ready to perform or record at a studio at the end of the training. This workshop is often delivered in tandem with Presentation Skills for Youth Advocates to assist in the student’s skills in delivering the media. 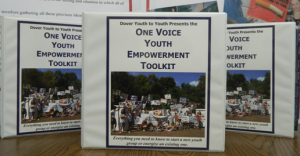 To request a presentation of Developing Media by Dover Youth to Youth go to How to Schedule Us in the Resources section of this web site.